November 2016 – A 300-bed teaching hospital, a dental hospital, a rehabilitation centre, a housing project, an office tower and a hospitality project are currently taking shape at the Gulf Medical University (GMU) campus in Ajman, which will make it the biggest private academic hospital in the Middle East. Spearheading this mega development is Thumbay Builders, a division of the Thumbay Group, which was set up barely six years ago as a brokerage firm leasing flats. Thumbay Builders is today a major developer across the Northern Emirates. Its portfolio of services cover four core areas of real estate development – design, construction, project management and asset management – which it intends to expand to include property brokerage, leasing and facilities management. The company is also aiming to grow its business in the next five years. Thumbay Builders is building the Thumbay Hospital, a 300-plus-bed teaching hospital, over an area of 356,000 sq ft, a dental hospital with 60 chairs covering an area of 37,000 sq ft and a rehabilitation centre spread across 27,000 sq ft, all within the existing campus of Gulf Medical University, where the group’s flagship hospital and university is located. The company is also working on a number of projects including a housing scheme at the GMU premises, which is expected to be completed in two years. It includes a hotel, separate hostels for boys and girls and staff accommodation over an area of 760,000 sq ft. The project, which will provide campus living facilities for students and faculty of GMU, will have studio, one-bedroom and two-bedroom furnished apartments. Also taking shape at the campus is an office tower over 35,000 sq ft and a 25,000-sq-ft hospitality project incorporating the Terrace restaurant, Body and Soul Health Club and Spa and Blends and Brews Coffee Shoppe, which are expected to be completed in nine months. Apart from the projects at the GMU campus, Thumbay Builders will also be involved in a 100,000-sq-ft expansion project at Thumbay Hospital in Dubai which entails extending the hospital’s outpatient department by 15,000 sq ft, and the construction of Thumbay’s head office, over 40,000 sq ft. These projects are to be completed in 18 months. In the region, it is also working on a 100-plus-bed hospital project in Qatar and talks are ongoing for a nursing school in Saudi Arabia. The total area of the projects under development add up to around 1.4 million sq ft and are estimated to cost a total of around Dh600 million ($163.3 million). Thumbay Builders is working on residential projects in India such as Thumbay Arcadia, comprising nine palatial storeys, Thumbay Plaza and Thumbay Residency, among others. The Thumbay Group has also opened a hospital in Hyderabad and is planning facilities in Bengaluru and Maharashtra as well. 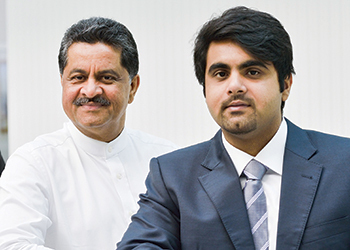 Thumbay Builders, he says, has been witnessing rising demand for its services across the board. “That’s why we are investing in expansion. Besides, we believe that the UAE is a long-innings destination with strong prospects in the coming years,” he adds. “To all those who have been sitting on the fence regarding the real estate sector in the UAE, this is the year to take the plunge. Prices have seen some correction due to the oil price fluctuation, but the long-term outlook for the real estate industry in the UAE continues to remain strong. “The country has taken gradual, but strong steps to diversify its economy, securing a hands-down win in aviation and tourism sectors – strongly supported by a stable political atmosphere and business-friendly law and order,” he adds. Thumbay Builders is now eyeing Egypt and other African countries for expansion. “We are focusing on Ghana to build a university and hospital, much larger in scale than our Ajman facility, with other courses like engineering. Land has already been acquired for the project,” Moideen says.